﻿Gaza, March 24 Thursday, In Gaza City, Israeli F16 warplanes bombed an intelligence headquarter named "the ship", using at least five missiles, also raided the al-Rayes mountain with one missile and a room that belongs to “Gaza” sporting club, also “Badr” security HQ belonging to the Qassam Brigades, Hamas militant wing, with three missiles. According to witnesses in the northern Gaza Strip, the shelling caused enormous material damage in the homes of civilian citizens in Maqqousi residential buildings which are located near the “Badr” security HQ, which was bombed with two missiles by Israeli warplanes. According to Adham Abu Salmeyah, Health ministry official, one citizen got injured by shrapnel in the face, he is 10 years old and his name is Raid Afifi. More injuries reported to have reached Al Shefa hospital for treatment. 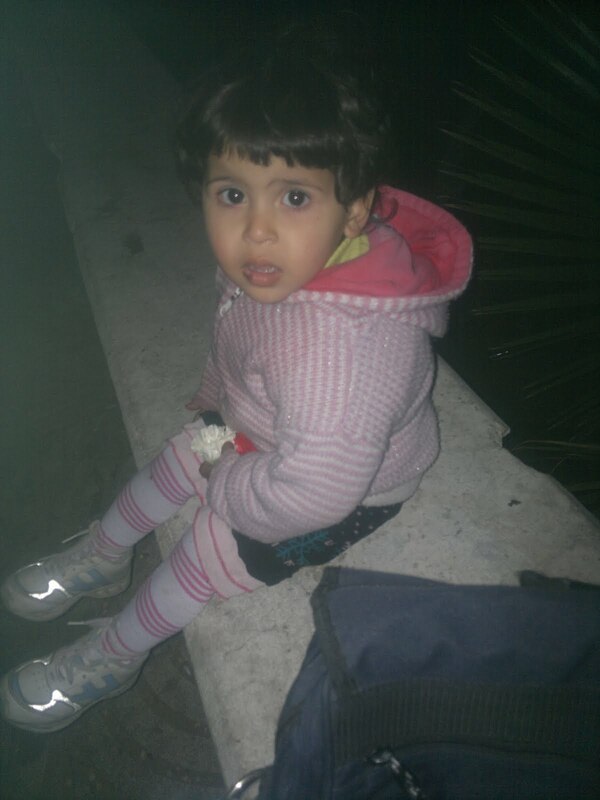 The loud bombing triggered a massive panic that hit women and children. In northern Gaza, Israeli artillery pounded the lands of the citizens with two rockets without reported injuries or damage. 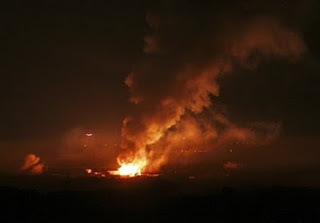 The Israeli artillery also bombed earlier the vicinity of the “Karni” crossing east of Gaza City with two rockets. The missile landed in an empty agricultural area without causing casualties among the citizens. The Israeli Air Force launched today two separate raids on northern Gaza and central Gaza City, wounding three civilians till now. Gaza, March 24 Thursday, Israeli warplanes carried out an over-night air raid across Gaza. 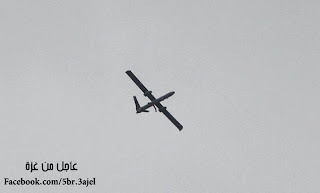 The Israeli warplanes launched a missile on a tunnel, east of Salah al-Din gate in Rafah, in the southern Gaza Strip. The Israeli warplanes targeted with four missiles "Bader" security HQ that belongs to Hamas located in the area of “Netsarim” former settlement, south of Gaza City. The heavy shelling caused the sound of huge explosions and hit high-voltage power lines causing power outages across entire neighborhoods in southern part of Gaza City.The high-voltage power lines sparked a fire that quickly starting spreading before the firefighters came and put it out. This came only minutes after Netanyahu declared that he gave the green light for his military to hit targets in Gaza by air. Adham Abu Salmeyah, health ministry official, said that no casualties were reported but a huge number of children were terrorized because of the heavy shelling and power outages. 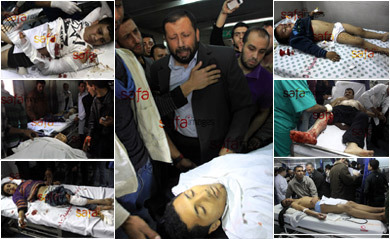 ﻿Gaza, March 22, Four men died and a fifth was wounded when the Israeli occupation forces shelled a civilian car near “Tunisia school” in Al Zaytoun district, east of Gaza City on Tuesday evening. 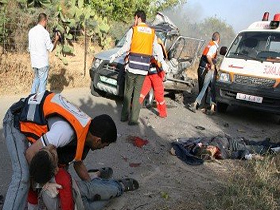 Medics spokesman, Adham Abu Salmeyah, reported that the wounded were injured by shrapnel in the lower limbs, while witnesses said that the martyrs arrived to “Shefa Hospital” in shredded pieces. The martyrs are resistance fighters from Al-Quds Brigades, military wing of Islamic Jihad, and they are: Sa’di Helles, and Adham al Harazin, Mohamed Attia al Harazin, and Mohammad Abed. Bringing the record of martyrs to 8 in one day and it looks like they are not done. Spokesman of the Israeli army claimed that their troops shelled a location where Palestinian militants were present in, located in Al Zaytoun neighborhood, and who have fired rockets toward Israeli towns, as he claims. The Israeli army raised the degree of preparedness in the wake of information about the intention of some factions of the resistance to carry out operations and attacks against the Israeli occupation army. ﻿Gaza, March 22, Israeli artillery shelled a residential area east of Gaza City on Tuesday evening, which led to the death of an elderly man, a boy and two children, in addition to the wounding of 10 others, including four children. Witnesses reported that four artillery shells fell on the door of a house belonging to Faeq Al Hilo near al-Rahman and Qura’n mosque located at the Al Shuja’eya neighborhood east of Gaza. They said the children were playing at the door of the house when it was targeted by the bombing. Local sources said that the martyrs were: Yasser Hamed Al Hilo (50 years) and Mohammad Jihad Al Hilo (11 years) and Yasser Ahed Al Hilo (16 years), and Mohamed Saber Harara (20 years). Medical sources are not yet sure about the precise number of the martyrs that fell as a result of that unjust vicious shelling on civilians and residential homes. Gaza heading towards a new war? He added that 10 injuries reached “Shefa” hospital in Gaza City, while 9 other injuries arrived at the Kamal Odwan hospital. He also pointed out that "Hijazi" clinic, north of Gaza City, was heavily hit by one of the raids and got really damaged, pointing out that it’s the only clinic that provides health services for more than 10 thousand in the north-west area. He claimed in a statement published by the website of "Yediot Ahronot" Hebrew newspaper, that the raids targeted two tunnels of the resistance, and two sites for manufacturing explosives and one weapons storage, the same lame excuse that they always use to raid Gaza as if they need a reason to bomb us. A series of air raids by Israeli "F-16" warplanes bombed the site of the Palestinian police that belongs to the De-Facto government in Gaza in the area of "Al Twam" north-west of Gaza City, but it was empty at the time of bombing. They also bombed a plastics factory east of Gaza City, wounding three civilians, including two children sustained minor injuries. 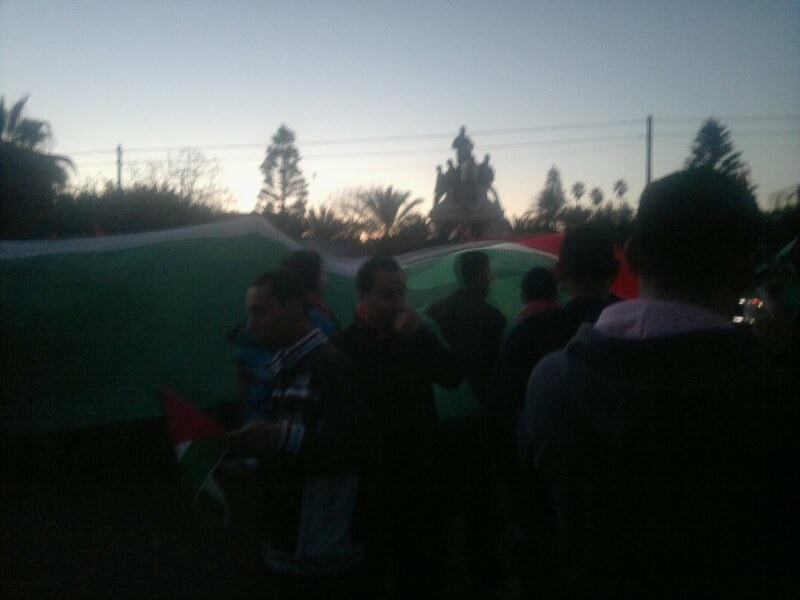 Today was epic, protesters gathered at al katibah and created a human chain and then moved to al jundi l majhool square and everything was fine till Hamas supporters showed up. 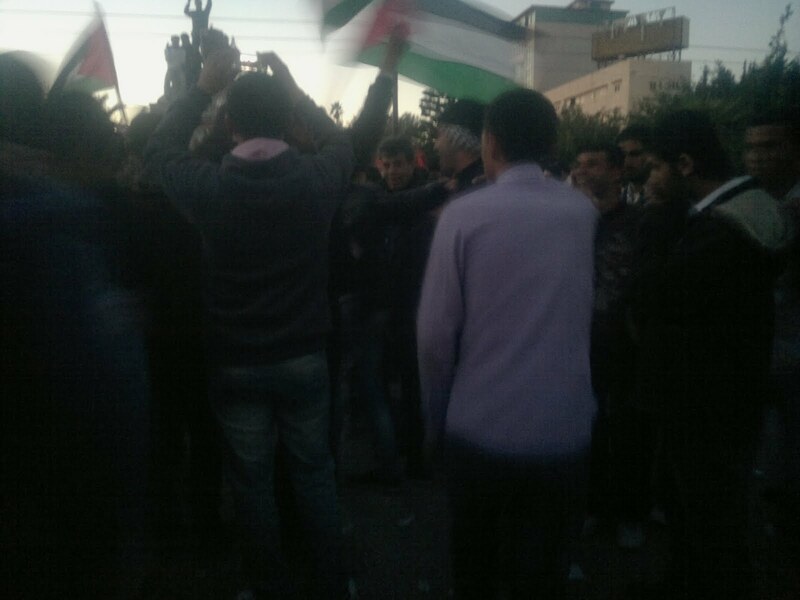 They wanted to take over by gathering at al jundi al majhool square holding Hamas flags, protesters resented that and tried to let them understand that #March15 movement is purely youth without any political background or political preference. 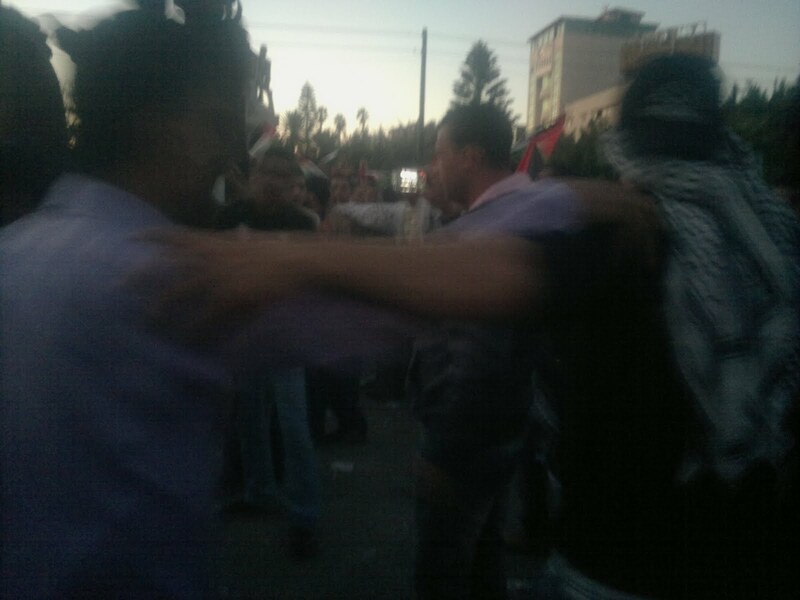 Light clashes occured between both groups, they exchanged throwing rocks at each other and some verbal profanities till the youth decided to leave al jundi sqaure and head back to al katibah because they arent looking for trouble. The atmosphere was buzzing and amazing there, many youth joined and many were coming every minute. Every one chanting, dancing and singing. The weather was awesome. I left to upload the pics and video I took because I lost my connection at al katiba, minutes later i heard that Hamas was warning everybody to leave alkatibah before 5 pm so as to not to risk epmtying al katibah by force. People ignored the warning and started flowing to al katibah and planned a sit-in and a sleep-in. 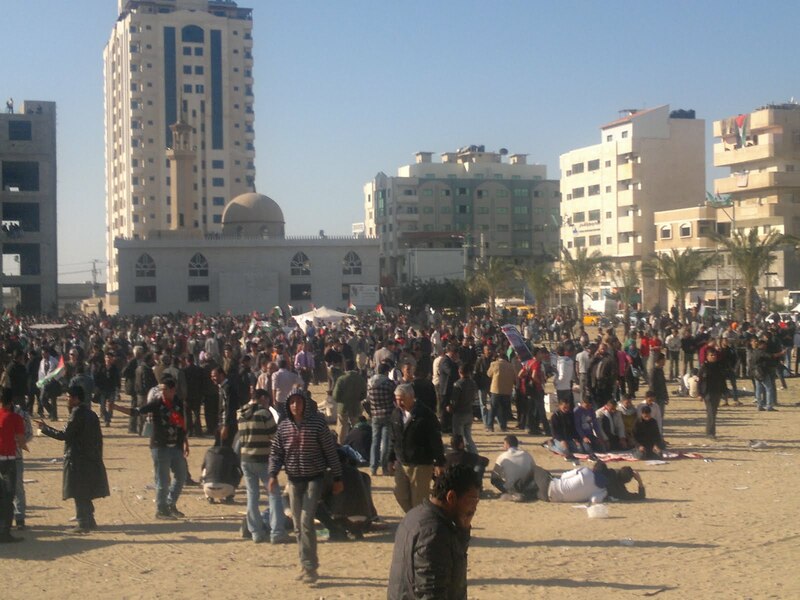 Things got ugly and Hamas ended up emptying al katibah by force, many protesters were injured. Tomorrow is mysterious, we dont know yet what will happen. Will people go to the streets again to protest? or take a rest? Only tomorrow will answer these questions. Who knows what will tomorrow bring. 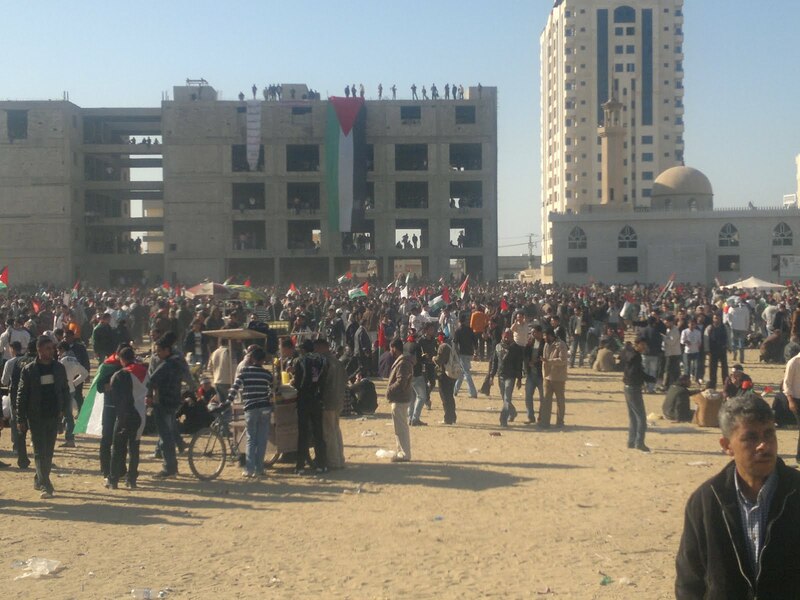 Gazan youth decided to make history a day earlier by starting the protests and revolting from today. They headed to Al jundi al majhool sq. (Unknown Soldier sq.) here in Gaza and decided to have their voices heard. Patriotic songs were filling the place on huge speakers. Gazan youth were dancing and singing along then chanting " No No to division" and "The people want the division to end". Since it was the 1st day and it came as a sudden decision it was a bit chaotic which is normal. It has it good sides and bad sides but you cant judge since its day 1. Gazan youth asked Gaza's municipality to provide the sqaure with lighting since it became so dark at night. Rumors started spreading about fighting, harassments and robberies but 90% of them were untrue and exagerrated. 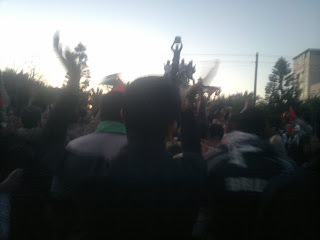 Youth were in high spirits chanting, dancing and waving the Palestinian flag demanding the end of the Palestinian divsion now. I saw people from all ages and all walks of life there, I saw dads and granddads with their children and grandchildren, also saw mothers, young women, young guys, little boys and journalists were all over the place taking pictures and videos. The number reached 1000 participant and many planned for a sleep-in at the square. Hamas is planning on joining the protests tomorrow by sending a huge number of Hamas-supporters. 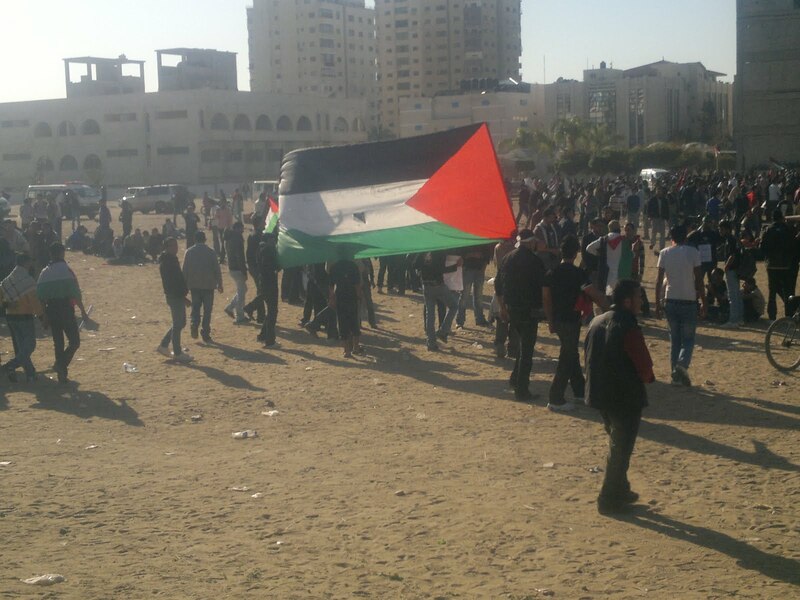 Gazan youth insist on the fact that the protests are non-political. Participants expect yet more people to come tomorrow and they also count on having a huge impact. 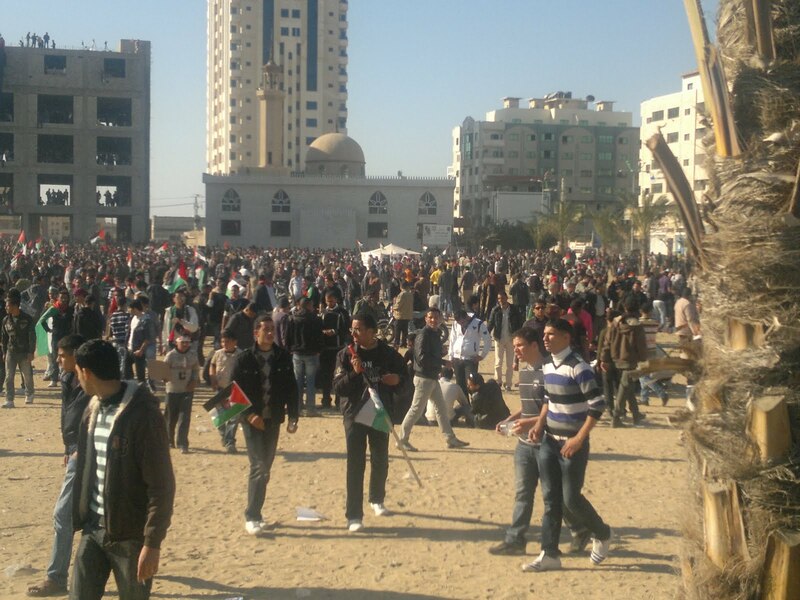 Tomorrow: Gaza has a date with history, will you be there? Finally, March 15th is tomorrow and we cant be more excited, enthusiastic and glad because we will be making history tomorrow. The Palestinian division has to come to an end and tomorrow is the date. I have heard so many mixed reactions on my decision to join the protests tomorrow and mainly everybody expected it to get ugly and get violent. But I was out last night and I saw the policemen actually helping youth while they were distributing the fliers asking everybody to join the protests tomorrow. I also learned now that Ismael Haniyah, PM of Gaza's De Facto government just asked Gaza's ministry of interior to actually let the youth protest and give them all the freedom they want because he personally supports the Gazan youth and thei demands of ending the Palestinian divsion. I just hope that Fatah adopts the same encouraging postion as Hamas here in Gaza and leave the protesters in Ramallah to protest without any violence, I am not sure if IOF would actually step in to oppress them too. I just wish them and us safety and success. Today is a huge day, I am getting ready for tomorrow. I need to bring a new Kuffeyeh for this important event :D and also bring a huge Palestinian flag to use it tomorrow. I also need to get familiar with twitter on mobile so I can stay intouch with you all and send you the updates second by second and hopefully pictures too. I wont deny that I was a bit worried of Hamas's reaction on tomorrow's protests but after seeing the policemen last night and P.M. Haniyah's statements this morning I am much more relaxed about it now. Ill do my best to keep tweeting the updates and hopefully share some pics too. 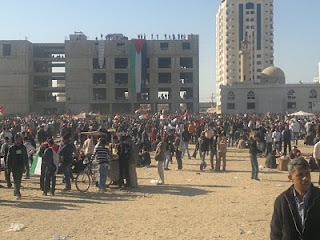 Inshallah 2011 will be the year of Palestine where we end the division then end the occupation. Will be mostly on twitter tomorrow on: Omar_Gaza then hopefully I would have the time to update my blog and facebook. Sending you all outthere our love and gratitude. Gazan youth are excited to be following the foot steps of their fellow arabs who started a successful revolution inspired by the Palestinian Intifada in the 1st place which was considered as a new way of revolting. Intifada even made it to the dictionaries. 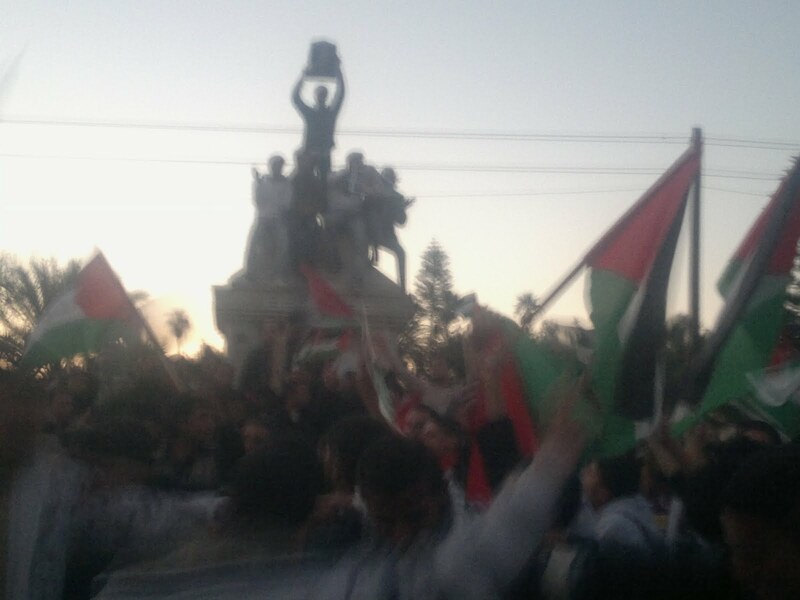 Gazan youth chose March 15th to be the historical date for a huge mobilized march that demands the end of the Palestinian division. This march is organized and directed by Youth and Youth ONLY. Its not directed or driven by any Palestinian political party in the background or behind the scenes. The march came as the Palestinian Youth's reaction to their frustration and anger of the Palestinian division and its about time this division came to an end. Seeing the Tunisian revolution, then the Egyptian epic revolt, Libya after that, Bahrain followed and a number of other Arabic attempts ofcourse gave us more hop and motive drive to join the March 15th protests in Gaza. Only 4 days to go and the count down started. We cant wait to make history. I will be there ofcourse since the start and will stay there to witness the whole thing no matter what happens. Again I would like to emphasize on the fact that I dont belong to any Palestinian political party and that the march is just like me, its not driven by any Palestinian political party. Its purely youth who want a better life and want to gain the freedom of their country by ending the Palestinian division first then Ending the Israeli occupation. I am not one of the organizers but I will be definately one of the particpants Inshallah. I will try to be tweeting non stop and also Facebooking about it in addition to posting pictures if everything went well Inshallah. Our time has come, and now its our chance to do something about the division. We need to be united to kick Israel out. We aim for a united Palestine, we hope our voices will be heard.